This Crystal Infusion midnight blue handmade Italian suede clutch, infused with tiny shimmering granules of crystal, is designed by Alessandra in her family-run workshop in Florence, Italy. Alessandra and her sister, Elisabetta, carry on the work of their father, Maurizio, as they continue to anticipate fashion trends with sophisticated styles, luxurious leathers and exacting detail. This handcrafted dazzling clutch is a one of a kind as touching it brings an undying satisfaction to everyone, and an aesthetic, making it eye candy to feast your eyes on. 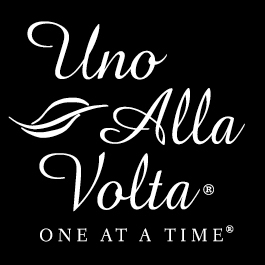 Their chic handbags have developed a strong following, which makes us happy to offer you this bag, handcrafted exclusively for Uno Alla Volta. No two will ever be alike. Each Crystal Infusion midnight blue suede clutch measures 10.25 inches wide, 6.75 inches folded and features one inside pocket and a zippered closure.